A wizard who is the best paranormal detective in Chicago. A psychometrist who works at NYC’s Department of Extraordinary Affairs. The newest van driver for the St. Edward’s Parish coroner’s office who seems to just walk away from whatever accident she has. Urban fantasy fans might recognize the above characters. I myself have gone on many adventures with them. But lately it’s occurred to me that these characters give me something more than just adventure. I see some of myself in them, and relate to them in ways that perhaps others might not. No, I’m not magical (or AM I?). But if you look at the daily lives of these and other urban fantasy characters, you’ll see that their powers don’t come without a price. With urban fantasy, instead of having magic in strange worlds, they have special powers in this world. And most of these characters struggle to find ways to function in this world as normal people, lest they attract negative attention (or even overwhelming positive attention). That sounds kind of familiar, doesn’t it? I have some of what I would consider some pretty cool powers. I have an astounding memory. The only thing I tend to forget is that not everyone can remember events blow by blow that happened twenty years ago. I can focus on something so much that I almost go into a trance about it--until something bigger and better attracts my attention (SQUIRREL!). This allows me to make connections between things that other people might not be able to. When my attention is on something, nothing can take it off--including the task I’m supposed to be doing at that time. My mind is never quiet. It’s always working. Which makes it rather difficult to sleep at times. Like, every night. My train of thought looks like spaghetti. But again--that spaghetti makes it possible to come to different conclusions about things than many other folks. I have a marvelous IQ. I think fast and work really well under pressure. I am creative about almost everything I do, sometimes from necessity. When one plan doesn’t work for something, I always have another ready to go. But sometimes those new plans happen when the old ones haven’t failed yet, and seem so lucrative. So I need to have a plan, and it needs to be in front of me all day, not covered up, so the new things that come up don’t take precedent over the old to-dos. I need some decompression time at night before bed, and I need to make sure I get everything done so I’m not obsessing all night. As you can see, my powers certainly have their drawbacks. But I know what my weaknesses and limitations are, so I work around them or with them so I can function in the real, normal world. Sort of like some of my favorite urban fantasy characters. No, that wouldn’t make things awkward at all. Simon has to wear gloves often, and he has a special room, his White Room, in his apartment where he can go to relax and not have to worry about stray psychometric threads. Everything in there is unused and has only been touched by him. He has his way of coping with the world, of grasping as much normalcy as he can. 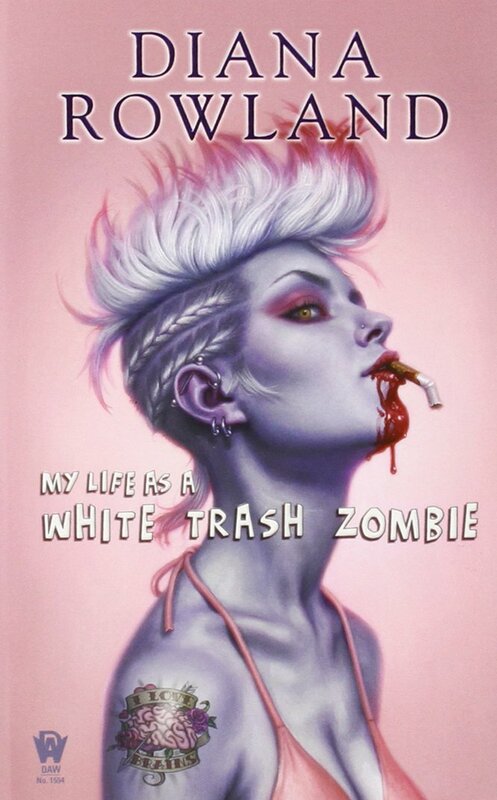 In Diana Rowland’s White Trash Zombie series, Angel Crawford has an interesting power. She heals incredibly quickly after having what should have been a fatal accident. In fact, physically, nothing seems to get her down. Well, as long as she gets her daily recommended dose of brains. Without them…well, things start to smell a little. “I took a quick shower and toweled off, then sniffed my arm again. It wasn’t nearly as bad, yet there was still a lingering aroma of something dead that clung to me.” (Diana Rowland, My Life as a White Trash Zombie) If Angel doesn’t get brains, her body starts to rot. And as you can imagine, brains aren’t exactly easy to come by. She gets around this difficulty (somewhat) by working at a morgue and forging connections with other people like her. Coping mechanisms, companionship, and knowing one’s limitations and triggers. These are all very real parts of life when you have things that make you different from others, whether they be magical powers or a hyperactive-hyperdrive brain like I have (also known as ADHD). There are pros and cons when you live life with special powers, but as we can see from the characters in these and many other books in the genre, as well as the superheroes in real life who face out of the ordinary challenges, you can prevail. We ALL have a balance of both positive and negative aspects, and life is about finding the way to live the best lives we can.